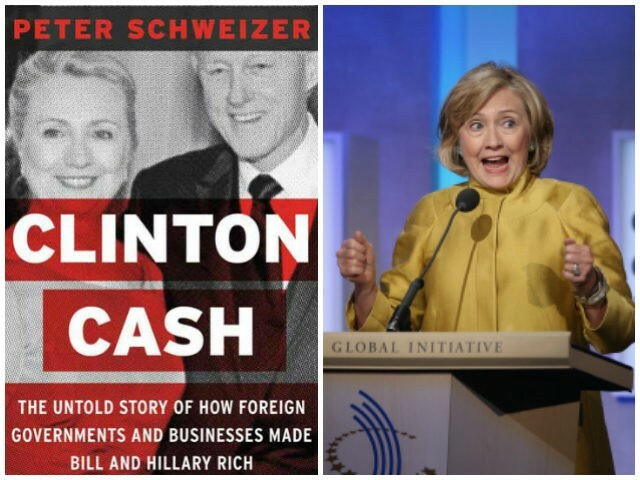 Breitbart News Senior Editor-at-Large Peter Schweizer’s 2015 book Clinton Cash: The Untold Story of How and Why Foreign Governments and Businesses Helped Make Bill and Hillary Rich was sold out in paperback on Amazon Thursday after fresh revelations about the Uranium One scandal. Schweizer, who is also the president of the Government Accountability Institute, broke the scandal as part of his broader investigation into the Clinton Foundation and how it had been used as a vehicle by foreign governments to influence Hillary Clinton when she served as secretary of state. The scandal centers on the partial sale of the Canadian firm Uranium One to Russia’s atomic energy giant Rosatom under the Obama administration. The administration had to greenlight the sale, as it resulted in the transfer of 20 percent of U.S. uranium stocks to Russia. Clinton was on the government board that would approve the deal in 2010. Schweizer reported in Clinton Cash how nine foreign investors in the deal gave $145 million to Hillary and Bill Clinton’s personal charity, the Clinton Foundation. Also around that time, Bill Clinton was paid $500,000 for a speech in Moscow, raising serious questions about possible “pay-to-play.” The scandal would dog Clinton throughout her doomed 2016 presidential campaign. The controversy re-emerged last week when the Hill reported that the FBI had uncovered “substantial evidence that Russian nuclear industry officials were engaged in bribery, kickbacks, extortion and money laundering” to expand Russia’s nuclear footprint in the U.S. as early as 2009, but the Department of Justice did not inform Congress or the public. The outlet also reported that the FBI found evidence that Russian nuclear officials had routed millions of dollars to the U.S. to benefit the Clinton Foundation around the time of the decision being made. The Senate Judiciary Committee, as well as two House committees, have opened probes into the timing and circumstances of the Uranium One deal since the Hill’s reporting. Republican leaders say they want to know what the relevant federal agencies knew about the FBI probe and when. Senate Judiciary Committee Chairman Chuck Grassley (R-IA) went a step further Tuesday, and calling for a special counsel to be appointed.